The Hook-billed Vanga is endemic to Madagascar where it occurs in all native forest types, below 1,200 metres of elevation. This solitary bird usually moves through the dense vegetation while searching for prey. It is the sole member of the genus Vanga. It resembles a shrike and is described as “sit-and-wait” predator. It has a robust bill with characteristic hook at tip, indicating a carnivorous diet including large insects, chameleons and other small vertebrates and invertebrates. Two subspecies share the distribution on the island. The Hook-billed Vanga is not globally threatened as it is able to adapt to degraded areas and is not limited to primary forests. It is fairly common throughout its range. The Hook-billed Vanga of nominate race has glossy black area from eye and central crown back to upper nape. Rest of head, neck and nuchal collar are white. The black upperparts contrast with the median and greater upperwing-coverts showing broad, white outer fringes and tips. On closed wings, this pattern forms a white panel. The primaries and secondaries have narrower white edges. The black tail has broad, greyish band and white tip. The strong, hooked bill is black with small pale grey spot near the tip of lower mandible. The eyes are blackish-brown. Legs and feet are blue-grey. The juvenile resembles adults, but the black upperparts have variable brown markings, and the bill base is grey. The Hook-billed Vanga has two subspecies. V.c. curvirostris (described above) is found in N, W and E Madagascar. V.c. cetera occurs in S Madagascar. This race has longer bill and less black on head that does not extend to lower nape. The belly is rather pale greyish than pure white. 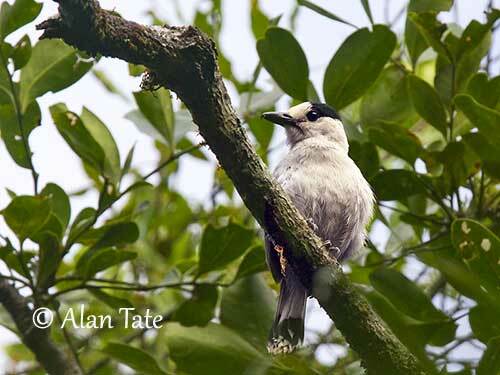 The Hook-billed Vanga of nominate race is common in W in deciduous forests, but it can also be seen in degraded forest edges, secondary growths and plantations in E and W lowlands. It is absent from the high plateau except in areas of primary forest. The race V.c. cetera frequents mainly the spiny forest. This species is visible from sea-level to 1,200 metres, but mainly to 1,000 metres of elevation. The Hook-billed Vanga gives a quiet “tew” as contact call. The alarm call is a loud, angry “karrkarrkarr… tewtewtewtew” often accompanied by bill-clapping. The song is a high-pitched whistle initially strong and then, it drops slightly “peeeeeeeeer”. It is usually heard in the early morning. The Hook-billed Vanga feeds on large insects and other invertebrates and small vertebrates such as chameleons, frogs, small birds and bird eggs, and occasionally young Microcebus lemurs. It forages mainly in dense vegetation, searching for invertebrates in loose bark or leaf-clumps. While searching for chameleons, it moves rapidly through the vegetation and hops from stem to stem. But it also spends long periods motionless and watching for prey. It is often solitary or sometimes in pairs. It may join mixed-species flocks of vangas and other species, but usually, it remains on the periphery of the groups. The Hook-billed Vanga is monogamous and territorial. The nest is built by two adults (probably the pair) and they also share the nesting duties. No helpers have been observed. The courtship behaviour is unknown. However, male feeding the incubating female is reported after observation of several nests. The Hook-billed Vanga is probably sedentary. In flight, the white wing panel and the tail pattern are conspicuous. 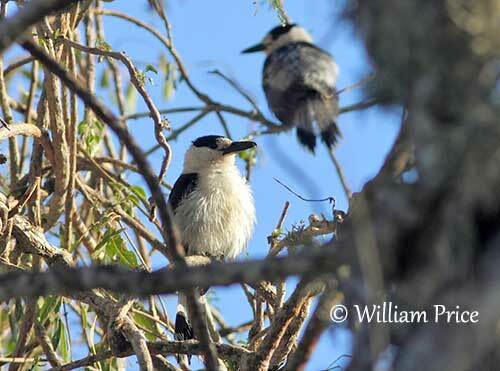 The Hook-billed Vanga breeds between October and January in NW Madagascar. 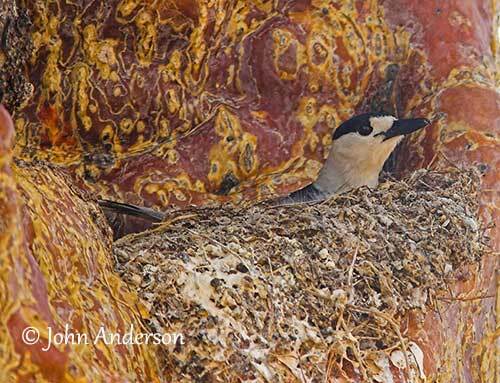 From some observations of five nests, information about the nesting behaviour is available. The nest is built by two adults, probably the breeding pair. The nest is placed between 3 and 10 metres above the ground, in tree fork. This is a bulky, cup-shaped structure made with green roots of Orchidaceae and Ficus, and twigs of Lauraceae, covered with mosses and spider webs. The female lays 3 white eggs with small dark red spots. Both adults share the incubation during 22-24 days. An adult was observed feeding the other at nest at the beginning of this period. The chicks are fed by both adults and no helpers were seen near the nest. The nestling period lasts about three weeks. The Hook-billed Vanga is fairly common throughout the range. The nominate race is commonest in W Madagascar, whereas the race V.c. cetera is common in spiny forest. The size of the population is unknown, but the species is not globally threatened. The Hook-billed Vanga is currently evaluated as Least Concern.